"A GROUP APPROACH TO DIVINITY"
NOTE: Allow yourself the grace of one hour or more to participate in the following Full Moon ritual. Being immersed in the Full Moon energies at the exact time allows for the greatest direct impact and reception of energies at their fullest potency. However, if this is not possible, the 12 hours before and 12 hours after the exact moment of the FM are the “holding hour” in Kairos time. During this period of expanded non-time, Angels tasked with 'holding the energy field' safeguard our participation with the sacred "Luminaries" during this sacred period where we can enter at will, with reverence and respect. All of course have the option of adapting the ritual to your needs. Solar Full Moon rituals are part of the emerging “New World” Religion. It is a privilege and sacred opportunity to consciously participate with the great Lives of a vast inner world order where the whole is seen as One. Through rhythmic cycles of group approach and invocation and evocation of the high Beings and energies of which we are a part, we are participating in and laying down the framework for the rituals of the new age. Regardless of what we are ‘doing outwardly' in the world, in the discipline of holding an interior Soul focus during these periods, intent upon making contact with the "living energies and Lives" pouring through the Solar System to the Earth and Her Centers, we are participants of a planned spiritual service and group approach to Divinity. All who are called to participate have committed to an inner “Soul-imperative” to organize their lives such that they are found participating in the rituals of the greater life of Sanat Kumara – the Lord of the World in Whose Life we live, move, breathe and have our being – and of Whom The Christ is a living Disciple. All who aspire to tread the path of Discipleship and Initiation are drawn and "set apart" for the disciplines that will eventually bring us to the feet of the Master and the higher spheres of Living ~ of "high powered Livingness". In the meantime, we serve with joy in our hearts and light in our minds. The Full Moon ritual that follows is a “living ritual” designed to access and come en rapport with the energies and living Lights and Lives of the Great Chain of Being. The Ritual can be followed exactly as written for progressively entering a vast inner world order, giving access to greater light and refined energy as veil after veil drops away, coming intimately en rapport with the high Beings overseeing Humanity’s progress. A seasoned ritualist or meditator may choose to adapt what is here and work only with the major elements such as the Great Chain of Being or Seed thoughts for meditation for this Sign. And yet, a well constructed “Iiving ritual” when repeated monthly by seasoned participants, gains potency and allows for greater ease of entry through invisible, vibrational doors to the inner worlds for the release of energy and gifts from these realms. Furthermore, Angels love ritual and work rhythmically — with the rising and setting sun, with new and full moon times and zodiacal seasons coming round and round, and with people who gather with intention in the seasons of their lives. When Angels are called with reverence and intention to participate in the high magic of God’s unfolding Plan, they come. Intensification of Spiritual expectancy is a major part of the inner work of the Group of World Servers. Keynote of the Soul: “I” come forth, and from the Plane of Mind “I” rule. “Aries is the sign of beginnings—the beginning of the creative process, the first step of the soul (the microcosm of the already initiated Macrocosm) towards incarnation, the beginning of recurring and constant cycles of experience [reincarnation], the beginning of the period wherein the soul changes its direction, its purpose and its method, and finally enters upon that definitely defined process which we call spiritual regeneration and initiation. (EA, 106) Let us think of the opportunity given us during Aries energy for spiritual regeneration in our own lives, in the life of humanity and for the Earth. CONTEMPLATE the recognition of your innate divinity so powerfully that it dominates your mind and controls your personality. Expect “The Secret of the Will”, evoked by the Soul, rising in you as unconquerable Goodness and triumphant Good — that Good which is of God. … and ultimately in Humanity. We make sacred Space with light and beauty. If you choose, now is the time to light our candles ... infuse our atmosphere with sacred aromas ... suffuse our space with sacred vibrations and sounds of music, sacred bell tones, etc. Above all, we irradiate the mind with high thought (as above) and infuse the heart with Love and Beauty. "Properly prepared we must always be" to step into vibrational resonance with the Holy Ones. Our group "prayer intention" is for "True Soul" contact, impression and inspiration from the Heart of the Christ. May our unified group approach to Divinity reach the Heart of the Great Ones. Standing in resonance with Them, may the Love burning in the Group Heart serve as a bridge of Solar Love pouring forth from the heart of "The Son of Divine Love" to all Kingdoms of the Earth. May we learn to Love All, Serve and Live from the True Source of our Being for the ultimate release unto true Freedom. May the guiding Light and Love of the Coming One "reveal divinity on every hand in every form" leading All to their final victory over death — as has been ordained from the beginning. ◊ Sounding the sacred word, Om, the breath of Life pouring through all the Centers, we step into the Peaceful Presence of the Soul … deepening inner Soul contact. ◊ With intense spiritual aspiration, raise awareness to the higher Heart Center above the Head, breathing the “Breath of Life” ... drawing in atoms of higher vibration … On an out breath, feeling, sensing refreshing waters of Life pouring through all the Centers. ◊ Properly prepared, holding the Mind steady in the Light, we vibrationally step into the radiant garden of a larger group Soul field … Golden white light pours through Participating Souls and Soul Groups gathered and gathering in love, beauty, harmony and the protective, regenerative potency of The Soul Star Group. We sound a Silent, OM, strengthening our unified group vibration … as the One beating Heart of the Group Soul registers through our awareness on the inner planes. … continuing to and through Centers of living energy — the Lives in Shambhala where the Peaceful Silent Will of God is known ... to and through the Heart of God where the Love of God is Known ... on to and through Humanity where on Earth we live... to and through All serving Groups inwardly gathered in sacred ritual ceremony on this day. Together As One, we Sound the Sacred Word, OM, confirming the great Heart, “the Lord of Divine Love" informing all life, eternally present. In the moments that follow, let us Be together as one Breath, one Life, in deepened Solar union, all Souls and Soul Groups assembling in group approach to Divinity. We sound the Sacred Word, OM (silently or aloud), confirming, sealing the new vibration. Angels love and attend rituals of rhythmic occurrence — from the rising and setting of the sun, to the rhythms of new and full moon periods, the zodiacal seasons that come round and round, to the gathering of people celebrating events and the seasons of their lives. 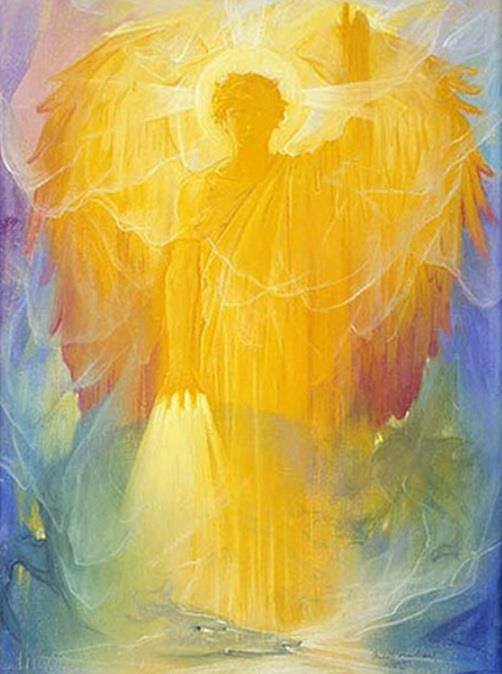 When Angels are called with reverence and intention, most especially those who are naturally inclined or destined to participate in the high magic of God’s life, they come when called or make their presence known. We have been fast entering an ‘Age of Angels’. Let us focus our awareness now on the great presiding Angels gathered and gathering for SOLAR FULL MOON ritual ceremony. In the silence of our hearts, we inwardly bid Them welcome for conscious participation in sanctified ritual ceremony (we may if we choose extend a ray of Lighted Love to Them to make stronger contact). So great are some of the ‘greater Angels’ that we have absolutely no control over Them, all we can do is be present with Them. Even so, we “act as if” we are invoking Them, to open ourselves and come into Their world. ◊ Great Cosmic Angels of the Solar Lord Whose Heart is a Sun — “The Son of Divine Love" … Angelic Lives streaming from the Flower of the Zodiac — a 12-petaled Life About Whom Naught May Be Said … Thy rays of life known through the warm radiance of the Sun … We bid Thee and Thy Holy Emissaries welcome! ◊ Holy, Holy, Holy — Great Hearts of Fiery Love … Solar Angelic lives from the Council Chamber of the Heart of the Sun, … Ancient Friend of ages long past stretching beyond boundaries of time and space and form … our Saviors true fallen from Heaven and favored by God … indebted to Thee evermore, we bid Thee our humblest welcome! ◊ Angelic Lives of the Planetary Spheres … transmitting Agents of Lighted Brother Sister orbs in the body of a greater Sun God ... we bid Thee Welcome! ◊ Mighty Angels of Shambhala and servants true of the Ancient of Days … Youth of Endless Summers — Sanat Kumara … Lord of the World, Whose Holy Will we aspire to Know — in Thy solemn Presences ... We bid Thee welcome! ◊ Mighty Angels of the Lord of Love — Teacher alike of Angels and of Men, standing radiant round about Him in reverence true … adorned in Sapphire Blue, Gold and White ... We bow before Thee and bid Thee welcome! We bid Thee All welcome! (DNA-II, 426) The objective of the planned precipitation of the “light supernal” is to "bring about illumination and the establishment of order upon the Earth". The giving out of the Great Invocation to humanity was the first step. "When the Christ, the Avatar of Love, makes His reappearance then will the Sons of men who are now the Sons of God withdraw Their faces from the shining light and radiate that light upon the sons of men who know not yet they are the Sons of God. Then shall the Coming One appear, His footsteps hastened through the valley of the shadow by the One of awful power [THE LORD OF THE WORLD] Who stands upon the mountain top, breathing out love eternal, light supernal and peaceful, silent Will. Then will the sons of men respond. Then will a newer light shine forth into the dismal, weary vale of earth. Then will new life course through the veins of men, and then will their vision compass all the ways of what may be. for yet another Age ~ the Age of Aquarius now unfolding. ... strengthening in each and every passing Decade. PREPARATION FOR INVOCATION: Let us read the following Invocation slowly, softly aloud, with solemnity, quietening power and sacred expectation that Those Whom we seek to invoke shall hear and respond to our unified call. With senses attuned in keen awareness, EXPECT to sense ‘revealed or imagined’ a magnanimous Circle of luminous Lights and potent magnetic power that is The Christ—World Teacher, and round HIM, the Masters of Love-Wisdom — Leaders of Ashramic Centers of Light, radiant Love and Holy Purposed Power. AS ONE, with pure intent we invoke the Great Ones — imaginatively enjoining all Participating Souls and Soul Groups to be in simultaneous vibration — in resonance with the Ashram of the Christ and the Masters of Love-Wisdom. STAND FOUR AND TWO OF COSMIC PROPORTION. A UNIVERSAL OM IS HEARD LOW, SOUNDING. DISSOLVING VIBRATIONS OF MATTER IMPURE. RADIATING "WILL TO LIFE" EMANATIONS. AWAKENED BY A COSMIC HEART OF LOVE. And A NEW EARTH RISING BEFORE THEM. AS FIRES OF PURE DEVOTION. … our energy system heightened by Their Vibration. (In this lifted vibration, "Veil the Third" is now sensed parting betwixt the planes wherein the Masters walk and those who as yet know Them not). We read the following slowly with invocatory feeling, intentionally invoking and intuitively sensing the 'sensed Reality' in whatever measure we are able, the "ONE GREAT BEING IN WHOSE CONSCIOUSNESS WE EXIST" reaching the planes of the Earth and our lives through our Consciousness and Awareness. Let us behold the Beauty of our Cosmos as we participate in the Glory of the ONE LIFE Whose Presence informs EVERYTHING — in Whom we Live and Move and Have our Being — inspiring us to be KNOWN. Imagined or revealed, let us behold the Beauty and Glory of our Cosmos. On to and through the Kingdom of Souls — the Spiritual Hierarchy, the Wholearchy of Love where the Love of God is Known ... "to and through" the Lord of Love Himself, the Christ — Leader of 49 Ashrams under Whose supervision and jurisdiction the Masters of Light and Love give allegiance — The “Master of All Masters, Teacher alike of Angels and of Men” — World Teacher of all Humanity known by varying names in the world religions yet remains one and the same (The Christ, Lord Maitreya Buddha, the Imam Mahdi, the Messiah, White Buffalo, … ). In the period of time remaining leading up to the Full Moon moment, let us move deeper in readiness to meet and stand within the Solar Fire energies of ARIES. IN THE FULL MOON ENERGIES OF ARIES, we are immersed in First and Seventh Ray energy — the Will to Love and Manifest, and the energies of the planetary transmitters (Uranus, Mercury and Mars) pouring through the solar system … through all that resonates with Them. Let us be poised in readiness to meet and receive what is streaming to and through all forms. CONTEMPLATE: find a phrase, seed thought or mantram below to hold in mind as the energies descend. “The secret of the will lies in the recognition of the divine nature of man. Only this can evoke the true expression of the will". "The secret of the will is … tied in with the recognition of the unconquerable nature of goodness and the inevitability of the ultimate triumph of good". The inevitable, ultimate triumph of Good. THAT WHICH CAN BE USED FOR DIVINE EXPRESSION. ANIMATED BY CEASELESS, PERSEVERING DEVOTION". THE DIVINE NATURE OF MAN IS THE SECRET OF THE WILL. ◊ Be immersed in the spiritual power of Love-Wisdom. The Will to Create ... pouring through the planetary transmitters of Uranus (Hierarchical), Mercury (Esoteric) and Mars (Exoteric) ... to Earth and through Her Centers. Into that Light, that Reality — we penetrate. Moving into Life — we take our stand. From the Universal to the particular — we love and serve. … the Soul Star Group and all consecrated groups on this Day. ◊ With your group, Be now a recipient channel anchoring THE WILL OF GOD IN THE MATRIX OF LOVE. To be "fulfilled" is to “Be filled full" with the Love of the Logos (the Love of God). CONTINUING IN THE SOLEMN SILENCE THAT FOLLOWS, LET US BE IMMERSED IN THE RARIFIED SOLAR FIRE ENERGIES OF ARIES. LET US remain open to the Life, Will and Love energies of this sign of new beginnings … of initiating conditions embodying the "Will to Create that which expresses the Will to Good" (for all). Let us be aware of opportunities to exercise THE Will in the "Matrix of Love" in the face of adversity or temporary setbacks so that a Greater Good, a Summum Bonum, can come forth onto the planes of every day living. Should hesitation, self-doubt or apparent lack of resources arise, call upon the Angel of Aries to be re-Minded that when 'We come forth, from the Plane of Mind, We Rule’. We are called to express the qualities that are good for all, lifting and redeeming all lives, raising them further toward their divine essential nature. Let us move forward with Joy, solidarity and conviction that a new day – a new world is emerging. "THE WILL OF GOD is MOVing THE WORLD." Safeguard this day of Contact. Preserving the inner silence … listening to ‘impressions’ today and in the "distribution" days that follow as new energy, intuitions and awareness 'fall into' the mind and heart and etheric system of us as Souls - as the Monad-In-Extension to the person on the ground of daily living. In the 12 hour period before and following the Full Moon, we remain subjectively in the "Silence of the Soul" regardless of outer activity. Today, we safeguard the energies received through Contact for fuller Registration. All other Music on these pages can be purchased on-line or in music stores to support the livlihood of the creative artists who created them.